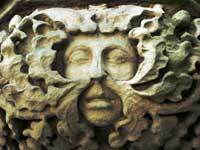 By any standards the Green Man is one of the world’s great historical enigmas. While his face appears on thousands of stone and wood carvings in hundreds of medieval churches and buildings, and on ancient sites around the world, no written record has ever been found that explains his presence in such profusion in some of mankind’s holiest places. Although there are several plausible explanations for the enigma, in effect none of them are anything more than educated guesswork. There is a complete absence of any documentary evidence or explanation as to who the Green Man is, or why his image is so common in Europe and the British Isles, often constituting the sole decoration in many medieval churches. This lack of historical attribution obliges us to come to our own understanding as to who he is and what he represents. As an image the Green Man is instantly recognisable. It is that of a human face, usually (though not always) male, intertwined with, and surrounded by foliage. In many cases the foliage is so vigorous that it issues from the mouth, nose, ears, and sometimes even the eyes. 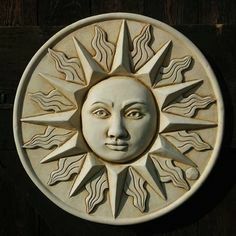 Always a carver’s device, whether in wood or stone, it is rare to find the Green Man in jewellery, illuminated books or stained glass, and no contemporary literature refers to him. What we do know is that the Green Man had been an influential presence long before his widespread proliferation in the Middle Ages. Before recorded history, when the existence of the human race was totally dependent on its relationship to the natural world, our distant ancestors knew him. His emergence in mankind’s most ancient myths can be shown to lie at the roots of human psychology. Somewhere between fifty and a hundred thousand years ago it appears that man entered into a new phase of existence, becoming aware of himself as a conscious, reflective individual. This ability to separate his awareness from the background of the natural world into which he was born came at a price. In separating the individual mind from its source in the greater consciousness early humanity experienced a double severance: that of the individual, and the social group as a whole becoming separated from Nature by its self-knowledge. Mythology, as a dramatization of events both actual and psychological gives us insight into mankind’s process of self-discovery. The story of Adam and Eve for example, expelled from Paradise for gaining the knowledge of good and evil tells us of the moment when mankind first became aware of itself as separate from its source. Some 35,000 years ago the first artists left evidence of their powers of observation. In the marvellous cave paintings of Chauvet-Pont-dÁrc, Lascaux, Altamira and many other places worldwide we can see the minds of these conscious individuals at work, expressing their awareness by creating images, not only of the world they saw around them, but also of their beliefs about the world and existence. Depictions of their companions and their enemies, of animals, and, occasionally, as in Altamira, South Africa and Mexico images of therianthropes, hybrid creatures, half human, half beast abound. These early artists personified the forces of nature and its spirits. Each archetypal representation of the Green Man we encounter as we travel back through time adds to our understanding of the need our ancestors had to revere the manifest intelligence of nature as the source of their knowledge and survival. The central theme is repeated over and over again: the birth, rise, death, and rebirth of all that lives or has lived, and the unbreakable connection between mankind and the great cycles of nature. To the ancient Egyptians the Green Man was the figure Enkidu in the Epic of Gilgamesh. Representing untamed, overflowing life, Enkidu stands as one of the earliest images of the potent energy that is the Green Man. 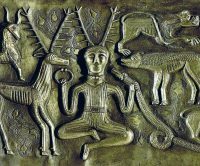 To the Celts he was Cernunnos, a god represented as having a special connection with animals and the natural world. 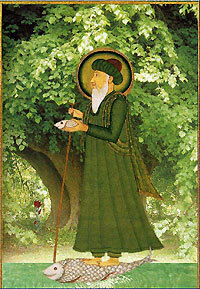 In Arabic culture we often find references to al-Khidir, the “Green” or “Verdant One”, a figure central to an early vegetation cult, who was perceived as a shaman, a representative of Nature, and a source of supernatural wisdom. The Green Man was well known to the Romans who encountered his presence in every corner of the world they conquered, and incorporated his image into many of their own constructions. Classical depictions thus became intermingled with the beliefs of the native populations. In Europe the essential mystery at the outset of any investigation into the Green Man is this: with the apparent consent of the clergy, at the time establishing the dominance of Christianity over the old religions, stonemasons and artisans, independent of one another, introduced thousands of pagan images into the nooks and crannies of their most holy places, the symbols of their fundamental beliefs about life, death, and the Creator. Furthermore all of this activity went entirely unrecorded. It is almost as though there were no need for explanation; it was enough that the images were there, a constant reminder of older forces at work in the world. This opens up the intriguing possibility that the early Christian Church knew exactly what it was doing when it allowed its holy places to be decorated with pagan and pre-Christian images, not as appeasement to the simple folk it was struggling to convert, but as a deliberate expression of its own belief that mankind’s evolutionary task was to forge a connection between the natural world and the world of spirit. And what of the artisans who actually did the work? Medieval carvers were neither elite artists nor holy men. Socially they were considered to be on the same level as skilled labourers. 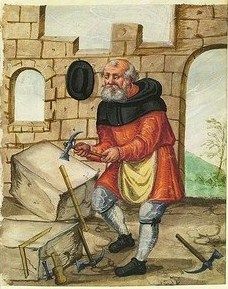 But the stonemasons and carvers had an awareness of the etheric world that breathed freely in the countryside in a time before the city encroached upon their sacred places. These men, wary of the possibility that their deeply rooted pagan beliefs were under threat from the new religion, were in a unique position to pass on the message of the Green Man to future generations. This they did in abundance. Nevertheless, despite their skill and dedication no mention is made of the Green Man in any Masonic documentation or ritual. Orthodox Christianity came to teach a Pagan people that heaven and spiritual attainment, was always somewhere else – in the sky, in the past, in the future. It belonged to someone else, and as private property was accessible only by joining the club and adhering to a strict set of rules and regulations. The old beliefs on the other hand, with their practices and rituals bound up with the cycles of the earth told us that all knowledge is present here and now in the world in which we stand, not through the offices of some specially gifted or appointed intermediary, but available to us all through observance of, and harmony with, the laws and rhythms of nature. The Green Man, as a personification of the concentrated life forces is symbolic of the desire to recreate Arcadia and reconnect mankind with his roots in the natural world. The image of the Green Man is coming into focus just at the time we need him most. This is a time when our awareness of what it is to live on the knife edge of ecological disaster is finally making an impression on our rational mindset, primed to regard the earth as a resource to be ruthlessly exploited. The Green Man embodies the mystery at the heart of our dependence on the natural world. In our need to rewild and reclaim our heritage as co-creators of an earthly paradise we need a symbol, one that was here long before our time and that will remain to inspire others when we are gone.